While there are many great vehicle options available to us here in California, not many can match the 2017 Versa Note when it comes to fuel efficiency. The 2017 Versa Note has also been given an all new design. Much like the Nissan Juke, buyers are able to customize certain parts on the Versa Note. To see our collection of the 2017 Versa Note, follow the link below. On the outside, the Versa Note has been given aerodynamic headlights. In addition to illuminating the road around you, they help keep the body streamlined. The taillights of the 2017 Versa Note have also been given a face lift. Easily recognizable, the swooping and aerodynamic taillights give the exterior a constant sense of motion. The sculpted side mirrors on the Versa Note perfectly flow with the rest of the unique body. Integrated into these side mirrors are turn indicators to increase your visibility. While traveling at lower speeds, the available Grille Shutter remains open for max air circulation. When you begin to speed up, the grille closes to reduce drag. The rear end of the 2017 Versa Note has your cargo needs covered. Whether you need to haul an antique table, or your gear for the beach, the available Divide-N-Hide Adjustable Floor allows you to haul it all. For taller items, simply lower the floor without having to remove anything. When you need a flatter surface for storage, fold the rear seats completely down. 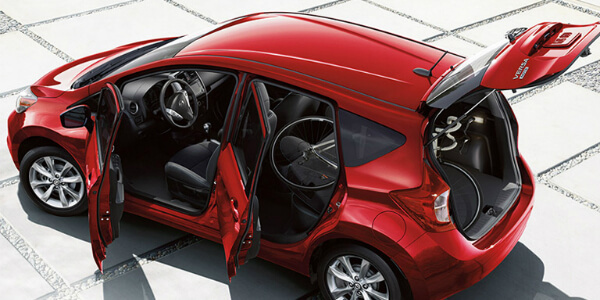 If you’re hauling any valuable you wish to keep out of sight, the Versa Note offers a convenient hiding place to keep your belongings out of sight. If you would like to learn more about the 2017 Nissan Versa Note, contact us here at Antelope Valley Nissan. One of knowledgeable and friendly team members will be more than happy to help you out. If you know that you would like to take a Versa Note out for a cruise, schedule a test drive right from our website! You pick the time and day and we’ll be sure to have the keys ready for you.